By the time the Epistle to the congregation in Rome was written, the Romans had occupied Judea for several decades. The Book of Romans was written near the end of Sha’ul’s third phase of ministry in approximately 57CE in Corinth Greece. The first Emperor of Rome, Julius Caeser, granted Jews legal rights to assemble, have common meals, property, govern, tax and enforce laws particular to their religious and cultural distinctions. This took the form of limited autonomy under the Synagogue and the extension of its legal body, the Sanhedrin. Despite this, the years of foreign occupation and growing Hellenism within second Temple era Judaism had caused much dysfunction and corruption to prevail. So entrenched was this corruption that the handling of the growing Netzarim branch of Judaism might have fared much better in the long run if Judaism had not endured such a rocky road. Having said this, without such a battered climate, the very appearance of Moshiach would have had less validity. So Judaism received many benefits from Roman, not unlike the benefits it received in Germany before the war. The unique peculiarities of Judaism in contrast to all other pagan religions and the privileges Rome granted the faith became a source of much resentment. Gradually a type of anti-Jewish sentiment among the population came to the fore. Added to this, extremist sects, such as the Zealots, continued to cause harm to their occupiers, leading to a collapse in the relational stability between Rome and the Jews. This culminated in a disastrous revolt and ended with the destruction of the second Temple by 70CE. Well before this, the existence of a certain level of self-government and legal autonomy can be seen in Sha’ul receiving religious authority to carrying out persecutions against the Netzarim. “Meanwhile, Sha’ul was still breathing out murderous threats against the Adonai’s talmidim. He went to the high priest and asked him for letters to the synagogues in Damascus, so that if he found any there who belonged to the Way, whether men or women, he might take them as prisoners to Jerusalem. (Acts 9:1-2)” Even Sha’ul’s eventual persecution by the Jews adds to this fact. He could not have received lashes or imprisonment had not Jews been allowed to enact their own cultural and religious laws (2 Corinthians 6:3-10; Acts 21:21-26; 32). It’s interesting to note that Sha’ul was a Roman citizen, which enabled him, if he so chose, to avoid punishment by the Jews. But this would have forfeited his right to speak and teach in the Synagogue and barred him from the Temple precincts. As it was, he only reveals his citizenship to his Roman captors (Acts 22:25). Rabbi Sha'ul was born in Tarsus, a capital city of Asia Minor (Acts 22:3). He was "an Israelite of the tribe of Benjamin, circumcised on the eighth day" (Philippians 3:5). There is reference to him having a sister with her own son in Acts 23:16 as well as other relatives in Romans 16:7,11 & 12. Sha'ul was a citizen of Rome (Acts 22:25 & Acts 27-28). Because Asia Minor was a province of Cilicia, a city declared free by Rome, all native born there were entitled to citizenship. Sha’ul HaShliach, who the world calls the Apostle Paul was a driven man. The name Sha’ul means “prayed for” and it is this Hebrew name that Yahshua addresses him by on the road to Damascus (Acts 9:4). The Greek name Paulos, given to him by his critics (Acts 13:9) means ‘short one’ or ‘midget.’ Sha’ul never came to establish the Church, a later version of the Anglo-Saxon name ‘Circe,’ which comes from the name of the daughter of the sun g-d Helios, who was worshipped on the Venerable Day of the Sun. The origin of the word "church" is not from the Greek word “ekklasia.” The correct English translation from this word is appropriately rendered as “congregation,” “assembly,” or “collection.” Early English translator William Tyndale uniformly translated “ekklesia” as "congregation" and in fact used the word "church" to denote a heathen temple mentioned in Acts 19:37. For many people there are parts of Rabbi Sha’ul’s letters that contain some challenging teachings. When sufficient study is not applied to these grey areas a believer can unconsciously open the door to theological error. Believe it or not, some Messy-anics reject Sha’ul’s teachings and think him a heretic. So it’s important to establish what the rejection of this man and his teachings does in terms of what else it pulls into the vortex. A rejecter of Sha’ul loses all the books of the Netzarim Ketuvim (The Nazarene Writings otherwise known as the “New Testament”) which are attributed to his authorship, such as Romans, 1 Corinthians, 2 Corinthians, Galatians, Ephesians, Philippians, Colossians, 1 Thessalonians, 2 Thessalonians, 1 Timothy, 2 Timothy, Titus, Philemon and the Book of Hebrews. Furthermore, the rejection of Sha’ul causes the loss of arguably the most central book of the Netzarim movement’s history, The Book of Acts, written by Rabbi Silus, who is commonly misunderstood to be the Gentile Luke. The Book of Acts is a follow-up letter to the Book of Luke, which was addressed like the Book of Luke to the current High Priest of Israel Ahabayahu, which means “A lover of Yahweh" (commonly given the Greek name Theophilus). So with the rejection of Sha’ul out go the Books of Luke and Acts as well. Of the twenty-one letters that make up the Nazarene Writings, Rabbi Sha'ul is attributed to having written fourteen of them. Thirteen books bear his name and the fourteenth book, Hebrews, is also attributed to him. Seven of the letters are accepted among Hebrew Scholars as if having been initially penned by Sha'ul's own hand. The others are thought to have been written by his closest talmidim (disciples) who, as was the custom among all Torah students, recorded many aspects of their teacher's life. Interestingly Sha'ul predominantly wrote to people who were already believers and who had a certain grasp of the Torah already. After Sha’ul’s encounter he was physically blinded. He remained in such a state for precisely three days, harking back to the duration of Jonah’s confinement in the belly of a great fish and the duration of Messiah Yahshua’s post crucifixion ministry in Sheol. Furthermore, Sha’ul doesn’t return to Jerusalem for three years. From the time of his conversion, it takes him fourteen solid years to get any traction. His early attempts to do Yahweh’s will is met with disastrous results requiring him to be lowered over the wall of a city in Arabia (Acts 9:23) and coming to blows with Goyim causing him to retreat to his birthplace. Sha’ul didn’t change religions after his conversion; he just saw more clearly the true nature of the one he already adhered. He attended and spoke in synagogues after his conversion (Acts 13:5, 13:14-15) and even observed Sabbaths in communities that did not have synagogues by meeting with believers outside the city walls (Acts 16:13). The Synagogue as a permanent institution originated in the period of the Babylonian captivity, when a place for common worship and instruction had become necessary. Synagogue is a Greek word and means “House of Prayer.” Jews usually use the Yiddish term Shul, which is where we get the word “school.” However, the Hebrew word for Synagogue is Bet ha-knesset. The prophet Isaiah refers to Elohim gathering in the scattered and bringing them joy in His house of prayer (Isaiah 56:7). The rabbis derive this as a prophetic announcement enabling all ger tshav’s to return to a locality, beyond eras confined to when the Beit HaMikdash (the Holy House [The Temple]) is standing. The Synagogue was central to Jewish life. It provided education, administration and law enforcement. The Synagogue leadership were responsible for child welfare, the poor, widows, orphans and even burying the dead. Synagogues weren’t used to preach in, but to teach in. Foreign religions preached, which was an act that the coaxed people what to believe, whilst teaching imparted to people what they should know. That’s why we were called talmidim (usually translated as “disciples”), which means “taught ones” as opposed to believers. To have a belief is a doubtful is a doubtful state, whereas to have knowledge is a secure position. The term disciple is of Greek origin coming from the Latin term discipulus, meaning “disciplined one.” The Greek equivalent is “mathétés,” where we get the word “math” from “mathematic,” denoting a mental articulation of the mind to decipher a problem. There were quite a few Synagogues in Rome, consisting of large public structures, to private homes. The oldest and largest concentration of Synagogues was found near the centre of Rome, in a place called Transtiberinum, a place where many oriental communities also settled. All gatherings were considered to be held with the approval of a centralised synagogue, this made things easier for Roman authorities. 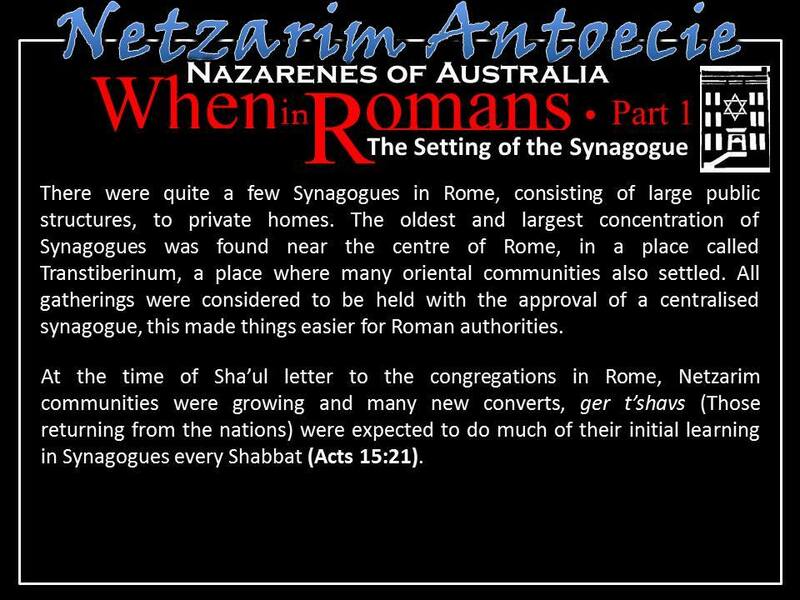 At the time of Sha’ul letter to the congregations in Rome, Netzarim communities were growing and many new converts, ger t’shavs (Those returning from the nations) were expected to do much of their initial learning in Synagogues every Shabbat (Acts 15:21). In Rome, the Synagogue was a system made up of groups throughout Judea and out of the land. Although there were varying views, factions and sects in different Synagogues, they all kept Torah, Sabbath, circumcision, and dietary halakhah. There was a hierarchy of authority that ultimately answered to the Sanhedrin. 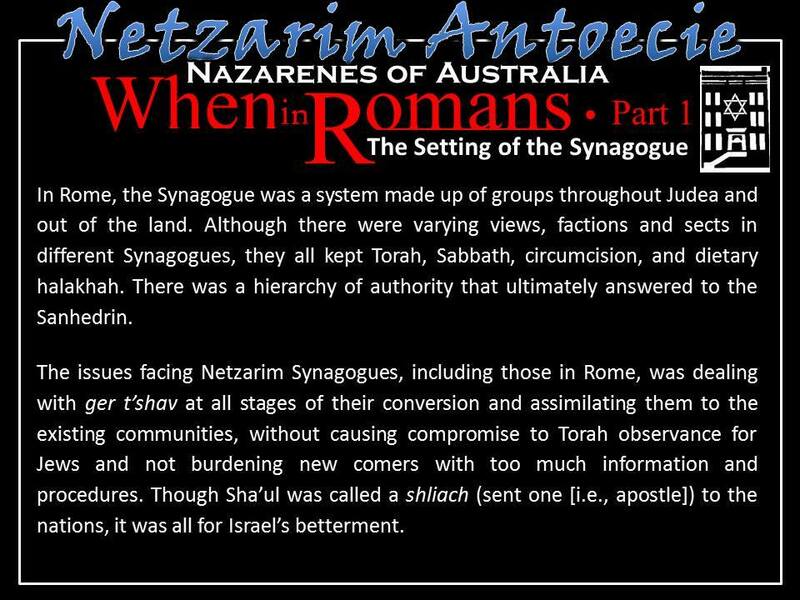 The issues facing Netzarim Synagogues, including those in Rome, was dealing with ger t’shav at all stages of their conversion and assimilating them to the existing communities, without causing compromise to Torah observance for Jews and not burdening new comers with too much information and procedures. Though Sha’ul was called a shliach (sent one [i.e., apostle]) to the nations, it was all for Israel’s betterment. As Sha’ul’s ministry build momentum, he longed to minister in Rome, a great city home to between three and four million people. 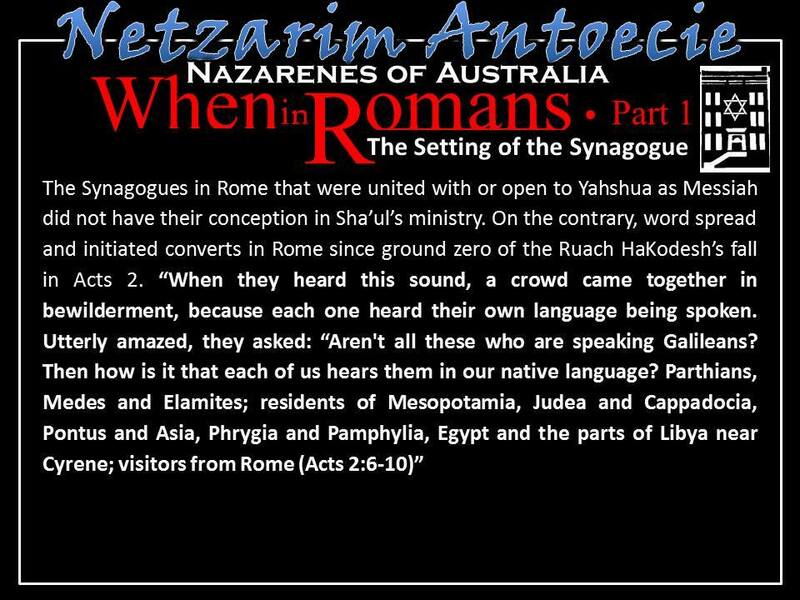 The congregation in Rome was well known among Netzarim. So much so that Sha’ul greets twenty-seven people in chapter 16 by name who he had never even met. But, like with any congregation, when you have a lot of people, you have a lot of different opinions. The congregation, as were most Netzarim communities, was made up of observant native born Jews of various levels of observance and coming from different sects within the faith. Scribes, Pharisees and respected Torah scholars had also joined the sect. On top of this, converts from all backgrounds were continually entering the community. This included common Roman citizens, freed slaves, soldiers, nobles, rich and poor. Within this diverse assembly existed the very orthodox and the very liberal minded. The liberal demographic were called Hellenists. Phases of conversion were known as ger t’shavs (returning gentiles), ger hashars (Gentiles near the gate) and ger tzadiks (righteous gentiles) - those who had begun to take on the entire covenant. The Book of Romans, along with all of Sha’ul’s works, is a work of brilliance, driven by the Divine animation of the Ruach HaKodesh. Their qualification as holy writ is not been a haphazard undertaking. When Yah breaths through a willing vessel, the words that appear are all of individual and collective value. Such words speak in easy language for the simple minded, an intermediate level for those of average intellect and a much deeper level for the wise. The Book of Romans is written as a type of form letter to be read out in all the Synagogues Sha’ul was planning to visit in Rome. Its main thrust was to bolster the centrality of Israel’s continued sovereignty through the continued observance of Torah with a focus on Yahshua as the finisher and perfector of the faith. He breaks down walls of separation between Jews and converts by moving through various topics that address misconceptions that were creeping into the faith. Most commentaries from a Messianic perspective tend to do an okay job on tackling the surface meaning of the text, but this is where the majority of them end. Rabbi James Trimm’s “Through the Book of Romans” series, available as a series of video presentations on the web, is the only study I’ve seen that really goes into the heart of the text with any level of sound Biblical clarity. We know that these rules are sound, because the Nazarene Writings use them in various places in the text. If you don’t know about them, you generally miss them. Sometimes you might pick up on some of them, but if you do, you don’t know that you’re finding deeper teaching that is part of an overall solid framework that is in no way a private revelation to you only. This is why studying the Talmud as a background text to Scripture can be so valuable because you begin to see the correct Biblical method of thrashing out all the possible meanings of a text that is in keeping with the harmony of Scripture itself. The first five chapters of the Book of Romans (Romans 1:15-5:25 specifically) are called a Petihah Midrash. Petihah is a Hebrew word that means “opening.” In Greek it’s known as a “Proem,” which means “prelude.” “Midrash” is a commentary using additional Scriptural text. A Petihah Midrash is where an introductory text is given, then a teaching is built on this introductory text often using additional texts. The sermon closes with a final text which usually repeats or alludes to the initial text. This process usually involves Hillel's second rule, G'zara Sheva (equivalence of expressions) thru which catchwords or keywords link the sermon together, being found in the initial text, the final text, often in the additional texts, and in the exposition itself. So by the end we have a teaching, which has been expanded upon by other teachings without undermining the original teaching, but rather giving it more insight. The first text is from Habakkuk 2:4, “The just shall live by faith” and the final text is from Genesis 15:6; “Avraham believed (or had faith) and it was counted to him as righteousness.” So the words “just” and “righteousness” are the same word in Hebrew. So having faith is righteousness or justness and Sha’ul ties these two passages together. Next week, we’ll go further and look at the sixth rule of Hillel to enable us to understand what Sha’ul is talking about in these early chapters. - Special thanks to Rabbi James Trimm for his extensive Romans research, which will be the basis of the coming week's teachings, Yah willing. So this is part 2 of the Book of Romans. Last week, we had a look at the climate around the time that the Book of Romans was written, such as Synagogues, especially in Rome, receiving an influx of converts from different nationalities, coming in based on the teachings of King Messiah Yahshua, which through a miraculous event, caused widespread interest in conversion to the faith. This being the case, the harvest was large, but the workers were few. At no time in history had a certain strand of Judaism become so popular to such a wide array of people. The challenge was to meet the needs of an escalating number of returning lost sheep, whilst not compromising the actual framework of the faith itself. Many ger t’shav (Gentiles returning from the nations) were beginning to become diverted in their thinking, following a rightly appointed individual (Yahshua ben Yoseph HaNetzaret), but inwardly gravitating toward a false path, a different faith separated from the True Way. Many traditional synagogues had two chief things to contend with, their position of Yahshua’s legitimacy as Messiah and dealing with mass interest to their faith, largely by foreigners already convinced by Yahshua’s credentials. Many Nazarene congregations, whether formerly traditional Jewish communities or otherwise, were feeling the strain of a multitude of false views bombarding them as their numbers grew. We looked at the author of the Book of Romans, Rav Sha’ul, and reckoned his true identity as Netzri Perush (Nazarene Pharisee) who upheld the Torah and was appointed to go to the nations for the benefit of kol Yisrael (whole Israel), rather than to abandon or divide Yahweh’s chosen people. It is simply by examining the records we have in the Book of Acts itself and Rav Sha’ul’s own writings that we can ascertain such views as being absolute truth. At no time was Sha’ul attempting to set up a new religion, much less a church. 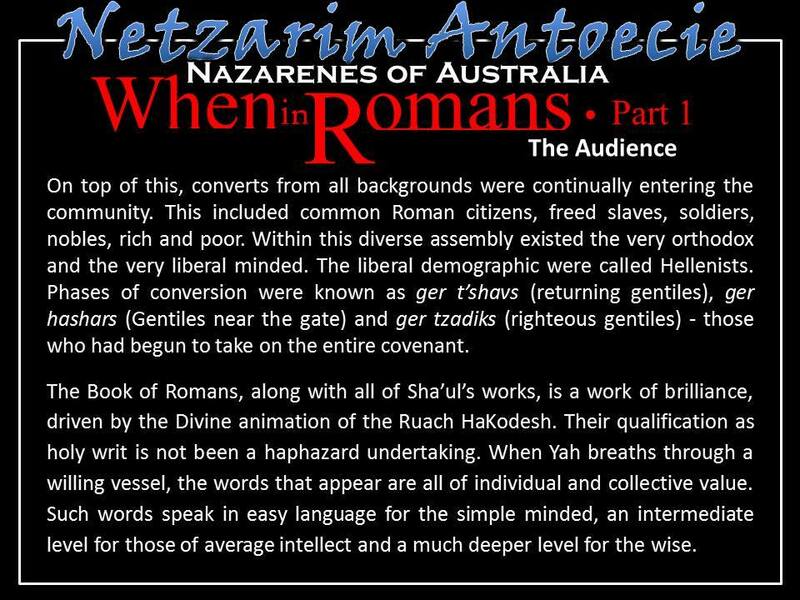 We looked at how Rav Sha’ul’s address to the Nazarene Yisraelite congregations in Rome was conceived as a both a substitute for his own inability to actually be there in person (at the time), and as a core reference work, which speaks on two chief levels, on the surface as letter that addresses right teaching and on a deeper level as a midrash, which takes the TaNaK and resolves apparent contradictions, reinforces already adhered to ideals, and draws new Messianic revelation to the ancient path of Judaism. We looked at the Seven Rules of Hillel. The Seven Rules of Hillel existed long before Rabbi Hillel (60 BCE – 20 CE? ), but he was the first to write them down. We see these rules employed throughout the TaNaK. Rabbis Hillel and Shamai were competitive leading figures in Judaism during the days of Yahshua’s youth. Hillel was known for teaching the Spirit of the Law and Shamai was known for teaching the letter of the Law. Yahshua's teaching largely followed that of the School of Hillel rather than that of the School of Shamai (an exception being Yahshua agreeing with Shamai regarding divorce in Matthew 19:9). Upon Hillel's death the mantle of the School of Hillel was passed to his son Simeon. Upon Simon's death the mantle of the school of Hillel passed to Gamliel. 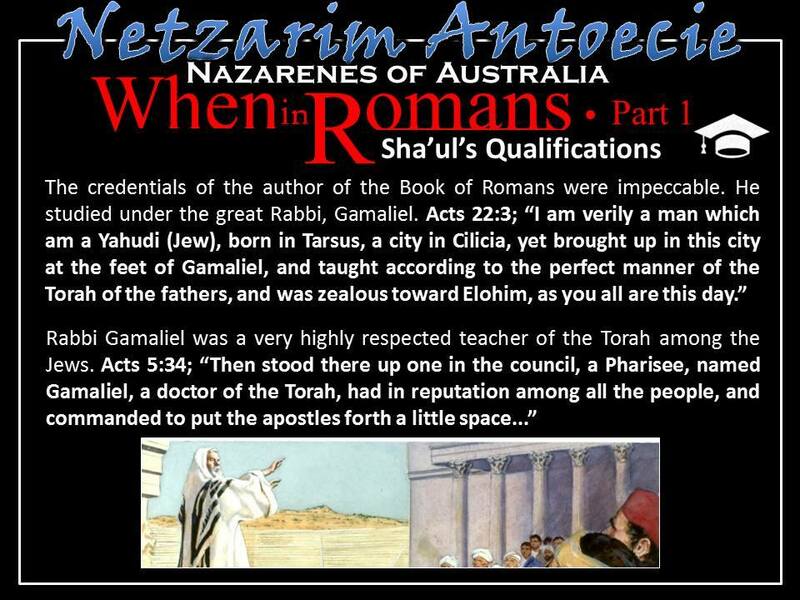 This Gamilel spoke in defence of the early Nazarenes (Acts 5:34-39) and he was the teacher of Sha’ul (Acts 22:3). In 2 Timothy 2:15, Sha’ul speaks of "rightly dividing the word of truth." Sha’ul was saying that there is a right way to interpret Scripture. Here, Sha’ul was almost certainly speaking of the Seven Rules of Hillel? 1. Kal Vahomer (Light and heavy) - The Kal vahomer rule says that what applies in a less important case will certainly apply in a more important case. A kal vahomer argument is often, but not always, signaled by a phrase like "how much more..."
2. G'zerah Shavah (Equivalence of expresions) - An analogy is made between two separate texts on the basis of a similar phrase, word or root – i.e., where the same words are applied to two separate cases, it follows that the same considerations apply to both. 4. Binyab ab mishene kethubim (Building up a "family" from two or more texts) - A principle is established by relating two texts together: The principle can then be applied to other passages. 5. Kelal uferat (The general and the particular)- A general principle may be restricted by a particularization of it in another verse – or, conversely, a particular rule may be extended into a general principle. For example, in the Gospels, the principle of divorce being allowed for "uncleanliness," is particularized to mean for sexual immorality only. 7. Davar hilmad me'anino (Explanation obtained from context) - The total context, not just the isolated statement must be considered for an accurate exegesis. So at the commencement of the Book of Romans we have Sha’ul’s elaborate greeting (Romans 1:1-14). In here we have him confirming his credentials, not as a leader, but rather as a servant of Messiah. “Do not be called leaders (instructors, teachers, masters); for One is your Leader, that is, Messiah. But the greatest among you shall be your servant. "Whoever exalts himself shall be humbled; and whoever humbles himself shall be exalted. (Matthew 23:10-12)” There is no question that Sha’ul is a Rabbi, Father and Leader of the Nazarene faith, three titles that Yahshua rebukes. But Yahshua is addressing the urge to cradle the prestige of these titles. He is not airing a pet dislike of mere words. The use of these titles on a person should make the recipient shudder with fear or be humbled (if you will), not be puffed up with pride. Whether, rabbi, father or leader, all pathways should magnify the one true rabbi, father and leader – Yahshua. Sha’ul then states he is a “sent-one,” not a member of the Netzarim congregation on holidays, sending some social greeting laced with religious encouragement. He is “set-apart,” i.e., entirely separated for the task at hand, not for the “good news” or “Elohim-spell,” but for the basar (the “full message” of the Scriptures). Then he confirms the foretold nature of what is happening in his present time, followed by setting out the credentials of Messiah as foretold by the navi’im (prophets). He greets with a “Shalom,” giving thanks for the Netzarim of Rome and mentions his constant recollection of them in prayer. So, before we go on, remember we are interpreting the Book of Romans using Jewish interpretation or Jewish hermeneutics. From Romans 1:15 we have what’s known in Hebrew as a Petihah Midrash. The word “petihah” means “opening” and the word “Midrash” means “investigation,” which is essentially a commentary that reveals additional insight to a Scriptural text, that is heavily dependent upon drawing from other Scriptural text. 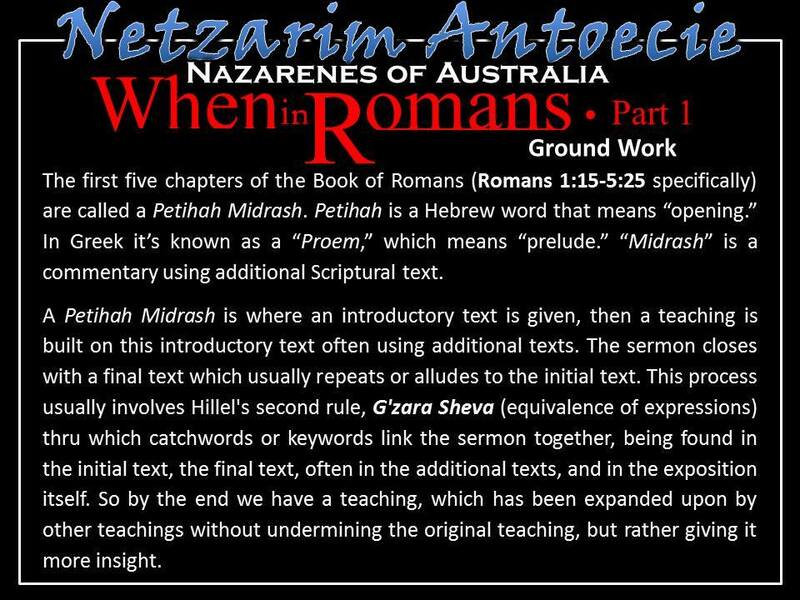 The first five chapters of the Book of Romans (Romans 1:15-5:25 specifically) make up the entirety of the Petihah Midrash. This means that if you were to just study the first Book of Romans, you’d never be able to draw out the reason why everything in it is being addressed. A Petihah Midrash is where an introductory text is given, and then a teaching is built on this introductory text often using additional texts. The sermon closes with a final text which usually repeats or alludes to the initial text. This process usually involves Hillel's second rule, G'zara Sheva (equivalence of expressions) through which catchwords or keywords link the sermon together. So by the end we have a teaching, which has been expanded upon by other teachings without undermining the original teaching, but rather presenting it with more clarity and insight. The next thing to understand is that throughout the Petihah Midrash, Sha’ul employs the Sixth Rule of Hillel, called Kayotze bo mimekom akhar, which means “analogy made from another passage.” This rule teaches us that two passages may seem to conflict until a third resolves the apparent conflict. But the concluding text in Romans 4:3, quoting from Genesis 15:6, resolves this apparent conflict where it says “Avraham believed (or had faith) and it was counted to him as righteousness.” The words “just” and “righteousness” are the same word in Hebrew - Tsaddiq or tsaddikim. So having faith is righteousness or justness and Sha’ul ties these two passages together. This is what we see constantly in Jewish literature. The contradiction is deliberate and ignites the discussion and brings about the solution. Added to this, there is an important issue that Sha’ul is resolving here. At the time of this letter, the Netzarim faith was receiving Jews from two other competing sects within Judaism, whose theology in a particular area conflicted. The supporters of Yahshua that had come from these two sects were battling to have their theology win the day in context of the wider belief in Messiah. These sects were the Essenes and the Pharisees. The Essenes had a certain theological view entitled “Works of the Law.” We know this, because apart from Scripture (in several places in the Nazarene writings) there exists no other document that contains such an expression outside an exclusively Essene based document uncovered amid the Dead Sea Scrolls. Yahshua was not an Essene. Seems like a safe statement, but some Messianics believe he was. The Essenes were a very pious sect, refraining from many things that the Pharisees did not, which incidentally, is the other competing sect that Sha’ul is seeking to address in the course of the Book of Romans. The first conflict is the beginning of this address. Again came Isaiah and reduced them [The precepts of the Torah] to two [principles], as it is said, Thus saith the Lord, [i] Keep ye justice and [ii] do righteousness [etc.].(Is. 56:1) Amos came and reduced them to one [principle], as it is said, For thus saith the Lord unto the house of Israel, Seek ye Me and live. (Amos 5:4) To this R. Nahman b. Isaac demurred, saying: [Might it not be taken as,] Seek Me by observing the whole Torah and live? — But it is Habakuk who came and based them all on one [principle], as it is said, 'But the righteous shall live by his faith' (Hab. 2:4). True Pharisiasm was not righteousness based on works, it followed the line that righteousness was based on faith. This above quote is from the Mishnah. Though Yahshua was not an Essene, his forerunner, John the Immerser grew up as one. This is why Matthew 11:18-19 reads, “For Yochannan (John) came neither eating nor drinking… and “The Son of Man came eating and drinking.” Quite a few Essenes who followed Yochannan and then carried over to follow Yahshua had not yet fully let go of some of the baggage from this extremely strict sect. Romans 1:20-29 draws heavily from the Wisdom of Solomon, a book from the Apocrypha. falsely, yet they look not to be hurt. Remember, this is an exposition of Habakkuk 2:4 and the above are those who don’t live by faith. If we choose to live by faith Yahweh will make a way for us, but if we choose not to live by faith, Yahweh will also make a way for us. This is precisely what happened to the Children of Israel in the wilderness. The children of Israel doubted the Heavenly Father, so the Almighty said, okay, we’ll do it the hard way, so Israel stayed in the wilderness for 40 years. Sha’ul never discusses whether we should keep the Torah – ever, he discusses why and how we should keep it. 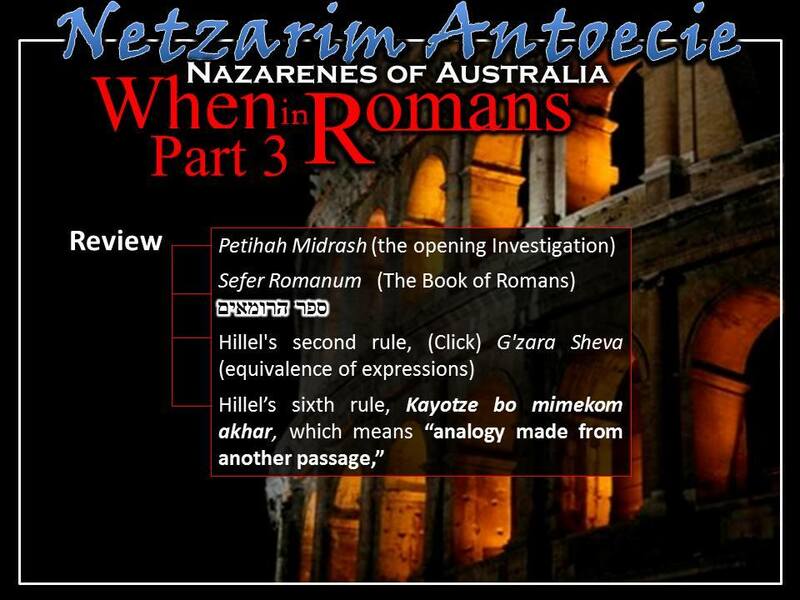 Sefer Romanum הרומאים ספר (The Book of Romans), which incorporates Hillel's second rule, G'zara Sheva (equivalence of expressions), where catchwords or keywords link the sermon together. In the course of this we saw how Rav Sha’ul uses Hillel’s sixth rule, Kayotze bo mimekom akhar, which means “analogy made from another passage,” to rightly divide בצדק לחלק (get right ruling) from the TaNaK on the issue of righteousness. To do this he first cites Habakkuk 2:4 in Romans 1:17, which says “The just shall live by faith” and pits it against Romans 3:10, which says “There is not one righteous, not even one…”based on Psalm 14:1-3, 53:1-3 & Ecclesiastes 7:20 resulting in a conflict. By applying a third passage in Romans 4:3, quoting Genesis 15:6, which says “Avraham believed Elohim and it was accredited to him as righteousness,” he resolves the apparent conflict. Again, Sha’ul solves the conflict by reiterating Genesis 15:6; “Avraham believed Elohim and it was accredited to him as righteousness,” by emphasizing emunah (trust/faith) in spite of a multitude of undeniable negative physical factors (Romans 4:23). We saw that Sha’ul was most certainly going somewhere with this subject in that he was addressing a predominant doctrinal view of a particular sect that was making inroads into the Netzarim faith. These were the Essenes. The Essenes were a sect of Second Temple Era Judaism that existed from the 2nd century BCE to the 1st century CE. They believed they were the descended from the rightful priests of Israel. They were fewer in number than the Pharisees and Sadducees, living in various communal style dwellings, dedicating themselves to asceticism, which involved celibacy, voluntary poverty and daily immersion. Josephus records that the Essenes existed in large numbers, and thousands lived throughout Judaea. They were also a group who possessed particular Messianic fervour and many were becoming attracted to the Netzarim faith. Many scholars believe that Yochanan HaMatbil (John the Immerser) was of the Essene sect. This week, Yah willing, we’ll be looking at Romans 5. 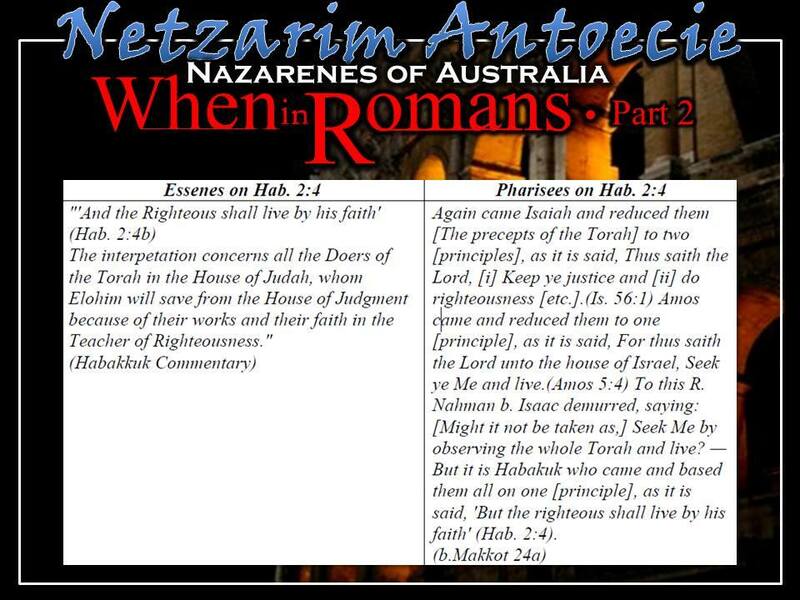 We’re taking the Hebrew and Aramaic text and applying Jewish hermeneutics and understanding the Book of Romans in terms of Second Temple era Judaism. So not only is The Book of Romans compatible to this ancient form of Judaism and Judaism in general, it actually also opens up and enlightens key aspects of Judaism and it’s relation to King Messiah Yahshua. In a way, the Netzarim faith is Judaism realised, in that it is what all aspects of true Judaism points to and works towards. Chapters 5 through 8 deal with the conflict between the two inclinations, the Yetzer Hatov, the inclination to do good and the Yetzer Hara, the inclination to do evil. There is an interesting question that is brought up by the rabbis of old. Before we go on we have to briefly discuss a theory in rabbinic Judaism called the Two Messiah theory. When we look at all the TaNaK prophecies directly related to Messiah we see some prophecies talking about a Messiah that comes and suffers to redeem his brothers and the other prophecies talk about a Messiah that rules and reigns on David’s throne forever. So finding this conflict between passages, some rabbis came to the conclusion that there would be two Messiahs, a suffering servant and a conquering King. Now we know that these are two comings of the one Messiah, a suffering servant first and ruling king second. In Rabbinic Judaism, the suffering servant Messiah is called Messiah the son of Joseph or Messiah the Son of Ephraim. The other is called The Son of David. So there is a conflict as to who is being mourned for in Zechariah 12:12, Messiah the son of Joseph or the hetzer hara? “It is well according to him who explains that the cause is the slaying of Messiah the son of Joseph, since that well agrees with the Scriptural verse, And they shall look upon me whom they have pierced, and they shall mourn for him as one mourns for his only son (Zechariah 12:10). Now the rabbis have the conflict of who is being mourned in Zechariah 12:12. Is it the Yezter Hara or the Yetzer Tov? Sha’ul is going to resolve this issue and show that they are both right. The death of Messiah is the defeat of the Evil Inclination. Here Sha’ul speaks about the Ruach HaKodesh (The Holy Spirit), a very much misunderstood concept. As we transition from our last subject of justification by trust, which brings shalom, Sha’ul is choosing to lead the charge on the next subject of the two inclinations be focusing on the Ruach HaKodesh as the Divine Soul. In Judaism two closely linked concepts to the two inclinations is the concept of the Divine Soul and the Animal Soul. The Animal Soul leads us toward the Evil Inclination. Then there is the נפש האלקית; nefesh ha'elokit (The Divine Soul), which is a spark of Yahweh that is given to us. Now what’s a Yezter? Does it mean inclination? No, it doesn’t! It actually means “combined form.” So the Yezter Hara can also be referred to as the “formation of what is evil” and the Yezter Tov the “Formation of what is good.” This doesn’t mean that the term “inclination” is wrongly applied. It is correct, but the better meaning is that there is a particular inclination set in a man because of its formation in him. So man, at the very outset of his creation was formed with these two inclinations. If this wasn’t so, man would not have been imbued with freewill. By freewill’s very nature, it has to be balanced between two opposing forces. According to the Tanya תניא …what is the Tanya? The word Tanya is Aramaic for “taught” or “we have learned.” The Tanya is an early work of Hasidic philosophy, by Rabbi Shneur Zalman of Liadi, the founder of Chabad Hasidism, and it was first published in 1797. It chiefly deals with an intellectual analysis of the two inclinations. The Zohar (meaning “splendour” or “radiance”) is a group of books including commentary on the aspects of the Torah (the five books of Moshe) on unusually high level. It contains a discussion of the nature of Elohim, the origin and structure of the universe, the nature of souls, redemption, the relationship of Ego to Darkness and "true self" to "The Light of God", and the relationship between the "universal energy" and man. Its scriptural exegesis can be considered form of the rabbinic literature known as Midrash, which elaborates on the Torah. The word “ruach” means “spirit,” but it literally means “wind” or “breath,” and if it’s holy, it’s breath from the mouth of Yahweh. The Ruach HaKodesh is breathed into us and what does it lead us to do? “And I will put My spirit within you, and cause you to walk in My statutes, and you shall keep My ordinances, and do them. (Ezekiel 36:17)” The Ruach enables us to keep Yahweh’s Torah! The Ruach HaKodesh guides us to observe the Torah. At the end of verse 5 we have the Ruach HaKodesh given to us to cure the aliment (the Evil Inclination). “For while we were still helpless, Moshiach died for the resha’im (the unrighteous persons, the wicked), doing so at the appointed time [Daniel 9:24-26]! 7 For only rarely will someone die for the resha’im; though efsher (perhaps) it is shayach (conceivable) that someone will dare to die for the tzaddik. 8 But Yahweh demonstrates His ahavah (hope) for us in that while we were still chote’im, Moshiach died for us. Verse 12 is the ignition point of the Evil Inclination. Not the similarity of the subject here in 2 Esdras, the first book of the Apocrypha. Back into the main text. So Sha’ul is telling us that Messiah has triumphed over the Yetzer Hara, which had its ignition point at the time of the sin of the Adamic pair. So Sha’ul is teaching us here that Messiah, through his death overcomes the Yetzer Hara. The ignition that caused the spark and subsequently the fire that has spread throughout all mankind becomes extinguished through the death of Messiah. - Again special thanks to Rabbi James Scott Trimm for enabling me to draw from his archive of research on this series.